Sure, luxury dining has its appeal. High-quality wine lists, exceptional (and typically small) plates of eclectic food, atmospheres that can transport you anywhere in the world. But, sometimes when you have a $5 bill in your pocket and a demanding appetite, a dollar taco can be just as satisfying as a New York strip. Going cheap doesn’t mean you have to skimp out on flavor. Ditch the drive-thru and try something new: from tried-and-true greasy spoons to economical newcomers, here are the best destinations for cheap eats around metro Detroit. Checker Bar is the Mr. Allen's of bars. 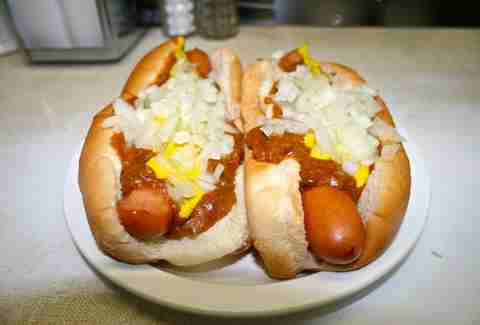 Checker Dogs -- made with Kowalski natural-casing dogs, chopped onion, and dill relish -- are two for $5. Sloppy Joes are two for $5. Sloppy Toms (same thing as the Joe but with turkey instead of beef) are two for $5. But our money is with the deviled eggs "4 Ways" (traditional, jalapeño, BLT, and lobster) for $3.50, because we are all aboard the gourmet deviled egg train. The somewhat revamped Corktown Tavern now has a food menu, and everything on it is $2. That includes chicken wings, fried meatballs, tots, and a simple old-school bar burger. TWO DOLLARS. 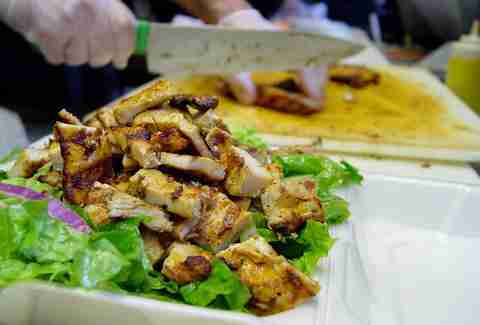 All hail the almighty Bucharest shawarma, which is pretty much the most famous sandwich in Detroit (yeah, probably even more famous than the Yardbird at Slows! ), and which is an even mightier $4.99. Few dishes are as uniquely Detroit as a corned beef egg roll. You can find the deep-fried delicacies at one of Asian Corned Beef’s four city locations: Grab a classic corned beef and swiss for $3, or the underdog ground beef, cabbage, and cheese for only $1.50. Outside of its egg rolls, the spot is known for its dangerously addictive deviled eggs. Pick up three for only a buck, or 37 cents each. Perhaps you've heard of this place? Coneys here are $2.65 (though we slightly prefer the same exact thing at Lafayette). Aladdin Sweets in Hamtramck specializes in authentic Bangladeshi cuisine, and Bangladesh is apparently a very affordable country because the food here is practically free. Nothing on the appetizer menu is more than $3.50 and that includes a kabob, tandoori chicken wings, four-piece braised shrimp in coconut cream, and an "Aladdin Special Burger." But for $1 apiece, we're all about the samosas. 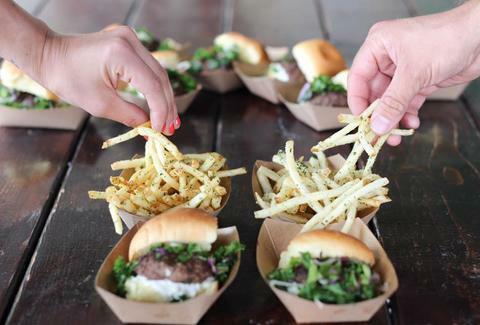 Since its 2012 opening, Green Dot Stables has continued to pack in guests looking for unique, cheap sliders. While you’ll probably need at least three or four, each of the craft sliders is only $3, including the rotating “mystery meat” option. Pair that with $3 well cocktails and $2 desserts, and you have a moderately priced meal still well under what you would've paid at other trendy eateries. 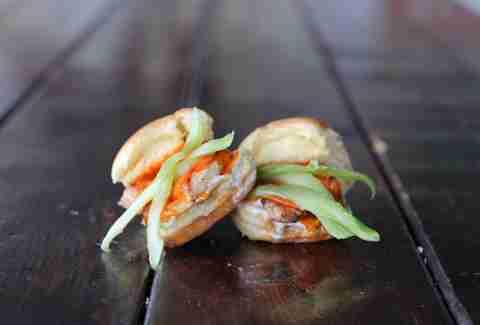 The Eastern Market Seafood Company sells these things called "Old World Sandwiches." What, you ask, is an Old World Sandwich? It is a combination of three smoked and fresh sausages (you pick from choices like beef kielbasa, Cajun andouille, bratwurst, and country sausage) on pita pocket bread with cheese, lettuce, tomatoes, and onions. And it's $3.50. For over 75 years, this Detroit sandwich shop has kept customers coming back for its mammoth subs, which are priced by weight, not by length. Kick that $5 footlong to the curb and try Gonella’s classic seven-layer sandwich for the same price. 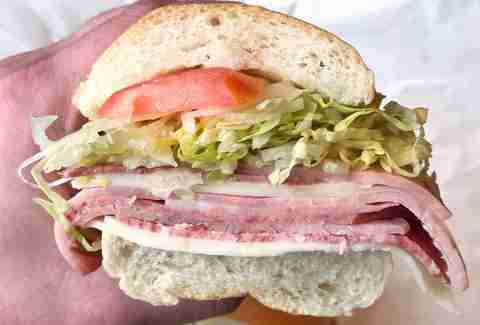 The Italian sub is made with six layers of various Italian meats, a layer of provolone cheese, lettuce, tomatoes, onions, and Gonella’s homemade dressing. Honest John's has the world's most magical hangover cure and it is its breakfast sandwich, made with egg, pork sausage, and American cheese on a giant English muffin for only $3.95. I’ll be the first to admit my bias in the famous battle of the Coney Islands, but if we’re comparing coney prices alone, Lafayette beats out American by 5 cents. Here you can grab a classic coney for only $2.60. In fact, everything on the menu (including the wholly underrated selection of pies) is under $5. Open until 3am weekly and 4am on the weekends, it’s the obvious choice for late-night fuel on the cheap. There are lots of Polish restaurants in Hamtramck, but none as cheap as Krakus, where you can get a half dinner of stuffed cabbage for $4.95. 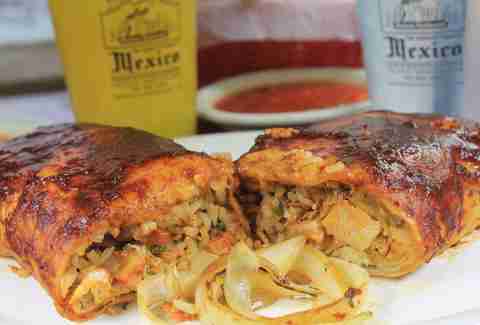 Nestled in Southwest, this Salvadoran restaurant is one of Detroit’s best kept secrets. The hole-in-the-wall specializes in (you guessed it) pupusas, a thick corn tortilla stuffed with fillings like chicken, cheese, and beans. You only need two, maybe three, for a ridiculously filling meal, and at only $2.25 a piece, it’s well-worth your pocket change -- pair a few with a refresco, and get out for under $10. A home-cooked quality meal at drive-thru prices. One of Detroit's most famous slider joints, Motz's serves sliders starting at $1.60, though we recommend opting for a double cheeseburger for a whole $2.95. 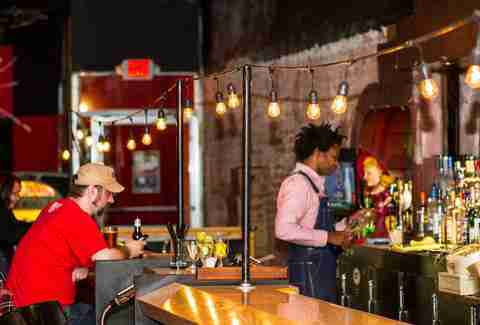 Detroit's most famous happy hour is not quite as cheap as it once was back in those golden days of 2009 -- the Roast Burger will now cost you SIX DOLLARS instead of $5 (*sobs*). But Chicken Livers and Polenta are still only $3! 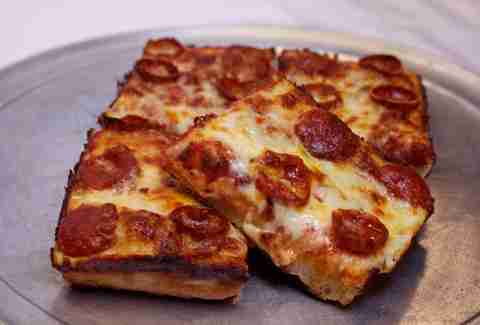 Supino is one of the best pizzerias in Detroit (and one of the best in the country! ), and while a whole pie is definitely the best way to go, it isn’t the cheapest. Pepperoni slices are $2.75 and Specialty slices (which you should definitely try because it's always something interesting, not unlike Green Dot's mystery meats) are $3.25. While the entrees at this Lebanese restaurant may be a bit pricier (and of a slightly higher quality) than its nearby competitors, the classic shawarma and shish kafta sandwiches are still the stars of the show. Pair one with a fresh smoothie, like the Royal’s Power made with carrot, beets, orange, apple, celery, and parsley, for a filling and inexpensive lunch you can still feel good about. We could easily populate this whole list with the taquerias of Southwest Detroit. In an effort not to be incredibly redundant or use "I do not think it means what you think it means" words like "authentic" (sigh), we'll just focus on a select standout from a select few places. At Taqueria El Ray, get the chorizo torta, a Mexican sub with lettuce, tomatoes, onions, avocado, and dressing, for only $5. Tony V's fully embraces its college town barn-ness, with ridiculously cheap daily specials that include $1 sliders on Saturdays. Sliders! 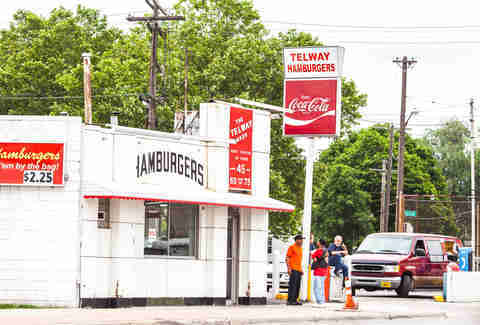 No one does sliders quite like Telway Hamburgers. Prices have barely flinched since this Detroit institution opened in 1944, with many menu items hovering around a dollar. The sign out front reading “Best Coffee in Town” is hardly a stretch, either -- java junkies can grab a cup to go, or pull up a seat at the counter for only 45 cents. The most expensive single-item dish? A chicken sandwich for $2.05. Well worth it, if you can manage the expense. WaLa's Shrimp Po' Boy is a new Detroit classic sandwich, and you can get the six-inch version for just $4.99. Yes, please. Yes. Right now, yes. If you’re looking for atmosphere, Evie’s may not be for you -- if you’re looking for a dozen of the best tamales in Southwest at only $8.50, though, you’ll be plenty content. You can even get a dozen frozen for $7. While the tamales will always reign supreme, lesser known (but still formidable) is Evie’s breakfast selection, all served with beans and rice. A massive order of huevos rancheros will run you less than $5. Bourdain wasn't the first person to discover the $1.50 coney dogs at Duly's, but he did give them national recognition and stole some thunder away from American and Lafayette. The prices at this place are as frozen in time as the place itself, AND it's open 24 hours, which is a hard thing to come by in Detroit. Because, hey, sometimes it's 4am and you need to eat $10 worth of $1.50 coneys. Open late every day, this American lunch counter in the middle of Hamtramck is a prime spot for inexpensive hot dogs, burgers, and fries after a long night out. Although it’s only been open for a couple years, regulars insist the location serves up some of the best coney sauce around. Headed by Rock City Eatery’s Nikita Sanches, it’s no surprise that even with the entire menu under $10, you’re still in for a treat. At Taqueria Mi Pueblo, the biggest bang for your buck is the 12in California-style "Super Burro" with meat, rice, beans, tomatoes, onion, cilantro, and hot sauce, only $4.85 during lunch, Monday through Friday. Whether you’re craving brunch or a late-night snack, this hot dog counter hidden inside the UFO Factory in Corktown is the ultimate cheap eats destination. Everything on the main menu, from signature hot dogs and grilled cheeses to tater tots and fries, is $5 or less. The brunch menu is equally frugal, topping out at $11 with a cream cheese and lox omelette. (No one wants cheap fish anyway, right?) Oh, and vegans can breathe easy: This place offers vegan hot dogs, cheese, and more. If you don’t know, now you know: This River Rogue staple serves up some of the best comfort food around at prices you wouldn’t believe. Locals have long revered Zenith for its breakfast, especially its biscuits and gravy (which are only available on Sundays). Got some loose change? Stop in any day of the week for a two eggs, toast, and potatoes that costs less than two bucks. What do you have to lose? If you find yourself in Downriver, you have to check out Joe’s. The sliders here are serious -- as in two will be more than enough. The classic ones -- topped with grilled onions, mustard, ketchup, and pickles -- are only $1.49 a piece, and you can toss on some cheese for only 10 cents more. Pair a couple with a $3 craft beer draft and get out for less than $10 with tip. Now that’s an economical meal out. While you patiently wait for Alley Taco’s second location to open in Midtown, you can still enjoy dirt-cheap tacos and burritos at the walk-up location hidden inside Marcus Market. 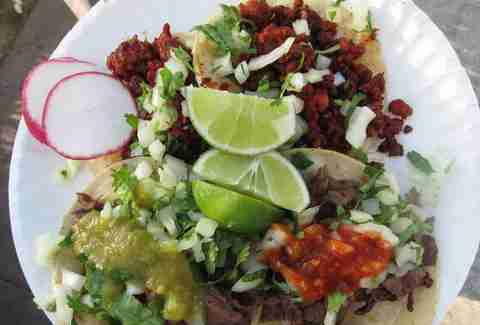 Here, you can pick up five-for-$5 tacos with fillings like garlic beef, fried chicken, or chorizo. Really hungry? Grab a burrito meal with your choice of meat and a side of chips and salsa for only $7.59. 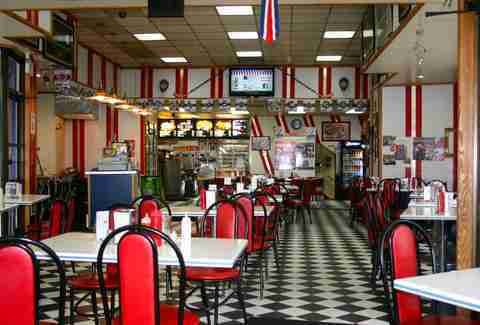 Wayne State University students have known about this greasy spoon for a while now. Since 1991, the Warren location has been serving up massive baked potatoes loaded with toppings like gyro meat, shrimp, roast beef, and more. A single potato, even with premium toppings, will cost you less than $10, and is more than enough for a meal. Feeling extra frugal? Grab a hot dog for only $1.50 -- it's easily one of the cheapest options on campus. One of Detroit’s lesser known newcomers is located on East Jefferson, right after Belle Isle. 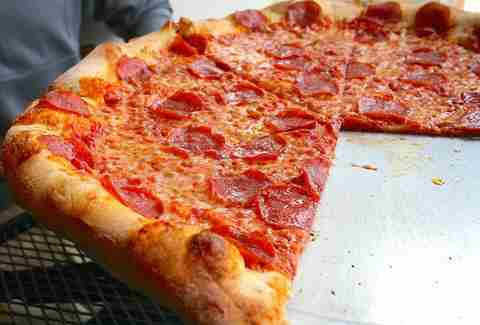 In the space previously occupied by beloved Garalino’s, Belle Isle Pizza continues the legacy of high-quality pies: get two mammoth slices of New York-style pizza for only $4.25. Feeding a family? Follow BIP on Facebook for regular deals like a one large topping, one large three topping, salad, and breadsticks for only $33.